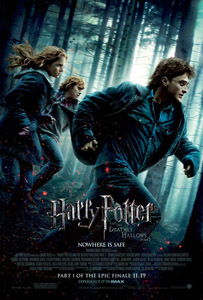 Harry Potter and the Deathly Hallows – Part 1 | personal.amy-wong.com - A Blog by Amy Wong. The film picks up right after the events on HP6, as Voldemort’s plans have been discovered by the general public, his group of Death Eaters must act quickly. Taking over the Ministry of Magic, and creating chaos in and out of the Magical world, killing Muggles and making headlines in “our” world. Harry’s family is ditched quickly from the story, and Harry’s left alone as he waits for the Order of the Phoenix to pick him up on the day of his 17th birthday — Harry’s finally of legal Wizardry age. He can perform magic now without being tracked, which will prove to be helpful for his non-school activities with Hermione and Ron in their search for Horcruxes — in simple terms, Volvemort’s soul-pieces. The situation is grim, but Kloves (back again for a Potter adaptation) never forgets the wedding, and there’s humor between those dark moments. It’s needed for the younger crowd, otherwise they wouldn’t be able to take it. The staying in the woods, all alone, no human contact except for the three of them. To top it all off, they’ve got a task, but they don’t know how to get there. Deathly Hallows Part 1 lays heavily on Daniel Radcliffe, Emma Watson and Rupert Grint, and it’s comforting to see them all grown and as more “seasoned” actors. They have learned their craft from the creme de la creme of British actors, and it’s good. The chemistry between them, friends as long as the characters have been, shows on their scenes… we could just wish it could be a Rated R edited version. The devastation would have been that much more powerful. There’s that thing about not showing blood in children’s films, there’s a little bit of blood in Harry Potter — two scenes jump out — but those “blood scenes” could have been saved for a particular scene with Hermione, someone we are much more invested on. Yates’ Deathly Hallows is more than an apt adaptation of the book, it captures the spirit of it an enhances it for the screen in a way that Cuaron’s captured the spirit of Azkaban. Not quite there yet because Azkaban is a better developed book, but up there among Potter movie adaptations. Still… I feel Part 2 is going to be dreadful. Your score is quite high for such a harsh text. The extra half a star is for actually improving the characterization of Ron. He’s pretty much 1/3 of the story. However, in the book it comes off a lot more like pure whining. It was “Ron My-Mom-Cooks-Freshly-Meals-Everyday” “Ron My-Mom-Does-My-Laundry” and Hermione spent half the day crying… in part because it was such a depressing situation… and in part because Ron was being such a baby. So kudos to the film to actually fix that.